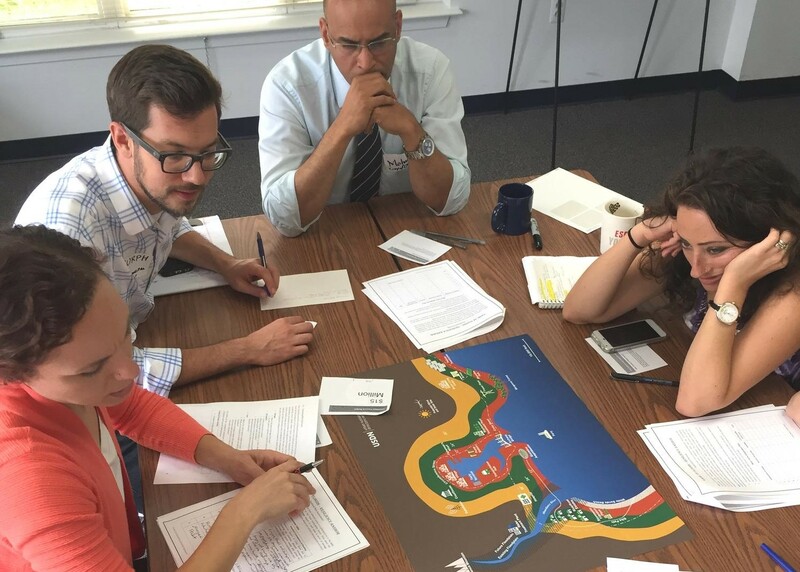 At a workshop held in Delaware this month, participants played a “Game of Floods” to learn in an interactive way about the risks that sea level rise poses to their community. Players took on the roles of city council member, local resident or utility provider, grappling with ways to respond to impacts and scenarios on a fixed budget. Here in BC – at least based on recent reports from the federal and provincial Auditors General – some of our elected officials and senior managers may need their own Game of Floods (or Game of Wildfires, or Game of Droughts). British Columbians are beginning to experience, in real life, severe floods and wildfires that scientists indicate are harbingers of our future in a changing climate. But even now, our federal and provincial governments don’t appear to fully grasp the need to do something about the expected impacts of climate change. As we’ll discuss in more detail below, some of the inaction must be attributed to the rules we currently use in BC for playing the Game of Floods – our provincial laws. These laws usually don’t acknowledge the ways that our human health and wellbeing are deeply connected to and influenced by changes in the health of the land and water. This has consequences for the way we collect data, the way we assess risks, and the way we fund responses. Criticism from the Auditor General – weak engagement in the Game of Floods, etc. As well, the provincial government has not yet significantly involved First Nations in provincial action. What about the value of healthy ecosystems? The report from the Auditor General forthrightly addresses some of the key shortcomings in the provincial government’s approach to climate change adaptation. However, the report failed to consider the government’s lack of action in assessing how different ecosystems may be vulnerable to climate change, and also the important role that healthy ecosystems can play in making our communities more resilient. Except for the description of some policies related to forestry activities, there is barely a mention of adaptation in an ecosystem context. In particular, the BC Auditor General did not comment on the province’s failure to investigate the vulnerability of coastal ecosystems to climate change. In areas like the Lower Mainland, where much of the coast is protected by dikes, coastal habitat will be submerged and lost as sea level rises if we simply raise and expand the hundreds of kilometres of existing dikes. Loss of this habitat will be directly devastating for many species, such as forage fish and migratory birds, and will have indirect impacts on many other species, including salmon and orcas. As we know all too well, these species already face many cumulative stressors that threaten their survival. Coastal squeeze: In diked areas, as sea level rises, valuable intertidal habitat will be permanently inundated and lost. There is also a growing body of research, which we have referred to before, showing that features of coastal ecosystems can provide important flood regulation services for coastal communities, such as reducing wave energy. It’s estimated that coastal wetlands in the northeastern U.S. helped avoid $625 million of damages from Hurricane Sandy. We know that BC will face more extreme storms as a result of climate change, and maintaining healthy coastal ecosystems could help provide an extra line of defence. The BC audit report focuses on raising and building dikes as the main response to sea level rise and coastal climate impacts. But according to another report commissioned by the Province, existing dikes in the Lower Mainland may be much more costly to upgrade than initially expected because they frequently do not meet current standards. Dikes can encourage a false sense of security and their failure can be catastrophic. In fairness to Ms. Bellringer and her team, provincial policy and regulation for coastal areas might have slipped through the cracks during the audit, given that the province has historically exercised so little of its jurisdiction, and responsibility, for coastal areas. In BC, the foreshore – the land below the high-water mark – is considered provincial Crown land in Canadian law (with some exceptions, such as foreshore land granted to federal ports under federal legislation and charters). The statutory basis for managing this Crown land is primarily the BC Land Act, which makes zero mention of coastal ecosystems or species, and is mainly concerned with the procedural aspects of Crown land management. While the province has some Crown land policies for the foreshore, none of them deal explicitly with ecosystem or species protection. Some foreshore areas have been designated Wildlife Management Areas (WMAs) under the Wildlife Act. Although these areas are supposed to have management plans, and this would be a logical place to consider climate change impacts, the management plans are often outdated. In the case of the Boundary Bay WMA, for example, the only management plan is a draft version that was prepared before the WMA was designated in 1995. Sea-level rise will engulf intertidal ecosystems and affect estuaries and coastal wetlands. Coastal storms will affect coastal ecosystems. Ocean acidification will affect a variety of species, including keystone marine species, with severe cascading effects that are already being felt. The second part of this report provides high level information about species, but does not consider ecosystem vulnerability. BC Parks assessed shoreline sensitivity to sea level rise back in 2010. This analysis was primarily based on shoreline classification inventory data (i.e. type of shoreline, such as rock cliff, or sand flat) in 2010, and the assessment was seen, in part, as a tool to identify areas where further investigation was warranted. According to this 2010 assessment 60% of the shorelines in the Strait of Georgia rated “high” to “very high” in relative sensitivity to sea level rise. Much of the Fraser Delta area was in the “very high” zone. Tidal wetlands are important habitats for salmon and a diversity of other fish and wildlife species. Tidal wetlands also provide a variety of other valued ecosystem services, such as trapping sediment, buffering coastal communities from flooding and erosion, and removing pollutants from surface water… The goal of this project is to assist coastal watershed councils, planners, resource managers and others in their efforts to ensure valued tidal wetland ecosystem services are sustained in the face of projected climate change. The BC audit noted that “[r]oles and responsibilities for addressing flood risk are spread across a number of ministries, and are split between the provincial and local governments.” This dispersal of responsibility makes it even less likely that impacts on coastal ecosystems, or resilience benefits to communities from intact ecosystems, will be taken into account without specific policy or regulatory direction. For example, more information is needed to understand impacts on ecosystems at the local and regional level, such as elevation data gathered through techniques that include LiDAR – light detection and ranging information that is collected in low level flights over the landscape. Some of this data has been collected by the Province and local governments in connection with flood management, but it is focused on areas above the high water mark. Despite the efforts of some BC government scientists and managers, climate adaptation related to coastal ecosystems has a very low profile, and was missed entirely in the Auditor General’s report. As a result we lack the data to inform decision-making and management. A further consequence is that funding programs for flood management are mainly focused on building or upgrading conventional flood management infrastructure, such as dikes. Even if there were opportunities for relevant funding, the projects funded are mostly at the local government level, within municipal boundaries that have been drawn without regard for scales relevant to ecosystems. A wetland, for example, may span two or more municipal jurisdictions. Although sea level rise may be arriving very gradually, the need to develop long-term adaptation measures that will make sense for both ecosystems and communities is quite urgent. If we proceed on the current path – where the rules and scenarios in our Game of Floods do not include consideration of coastal ecosystems – we risk locking ourselves into expensive investments such as high dikes, barriers and other structures that will cause serious harm to coastal ecosystems. Harming these ecosystems also harms the species that depend on them, including ourselves. So how do we ensure that climate adaptation plans in BC take the health of coastal ecosystems into account? The Province could start by supporting a study of coastal ecosystem climate vulnerability with funding for coastal LiDAR and bathymetric studies (studies of the beds or floors of water bodies). In addition, the BC government could work with federal emergency management and infrastructure funders to develop grants to support ecosystem protection and restoration projects that increase community resilience to climate change. Support is also needed for holistic coastal planning (involving federal, First Nations and provincial jurisdictions) that will allow us to assess opportunities for ecosystem-based adaptation and how this can complement more conventional approaches.